Heat 2 tbsp of olive oil in a large heavy skillet over medium high heat. Add 1/2 finely chopped onion and saute until translucent. Remove the skin and seeds from 2 golden nugget squash and chop squash into 1/2 inch cubes. Add squash cubes to the skillet and cook until softened, about 5 minutes. Add 1/2 bunch (about 1/4 cup) celery greens, 1/4 bunch parsley, 1/4 bunch chives, 1/4 bunch oregano, and 1/4 bunch parsley, all finely chopped, to skillet and saute for several minutes. Add 1 tbsp of curry powder, (or a mixture of 1 tsp coriander, 3/4 tsp cumin, 1/2 tsp allspice, 1/4 tsp fennel, 1/4 tsp turmeric, and 1/4 tsp black pepper). Add Swiss chard, chopped in 1/4 inch ribbons, in handfuls to skillet and continue stirring until all greens have wilted. Presoak 2 cups of long grain rice in enough water to cover the rice, then drain to remove excess starch. Add the rice to the skillet with 3 cups of chicken or vegetable stock and bring to a boil. 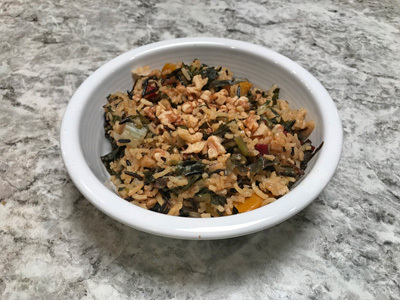 Add enough additional stock or water to just cover the rice, then add a lid to the skillet and cook for 25 minutes without removing the lid. Fluff rice before serving. Heat 2 tbsp of olive oil in a large heavy skillet over medium high heat. Add 1/2 finely chopped onion, 1/2 bunch (about 1/4 cup) finely chopped celery greens, and 2 finely diced green horn peppers. Cook for 5-10 minutes until vegetables are softened. Add finely chopped herbs and sautee another 5 minutes. Add diced tomatoes and cook, stirring frequently, for 5 minutes. 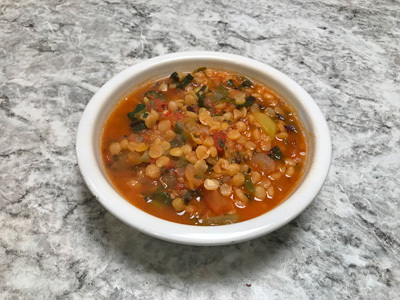 Add 1 1/2 cups of yellow split peas or lentils, 2 tsp of tomato paste, and 4-6 cups of water. Bring stew up to a boil, then reduce heat and simmer for 1 hour. Skin butternut squash and chop into ½ inch pieces. Heat 2 tbsp of olive oil over medium high heat in a large heavy pot. Add 4 cups of cubed squash to pan and saute until they become softened and the edges become golden brown, about 5 minutes. Transfer to a large bowl. Reduce the heat to medium and add 1 tbsp of olive oil, about 2 cups of ¼ inch slices of leeks (white and pale green parts). Add 1 tbsp of finely chopped winter savory, 2 tbsp finely chopped oregano, and 2 tbsp finely chopped celery greens, and stir leeks for about 5 minutes until they are tender but not brown. Add 2 cups of short-grain rice and stir for 1 minute. Add 1 cup of chicken or vegetable broth and simmer until absorbed, about 5 minutes. Add remaining broth ½ cupful at a time until all liquid is absorbed, about 15 minutes. 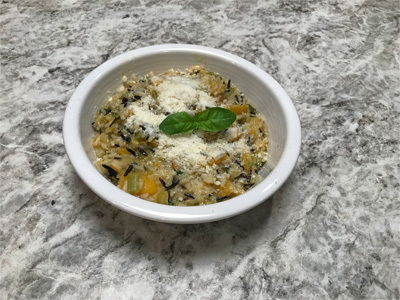 Return squash to pot and continue to cook until rice is tender but still creamy. Add 2 tbsp finely chopped parlsey, chives, and basil, and continue to cook for 10 minutes longer. Remove from heat and season with salt, pepper, and Parmesan cheese. Remove skin from beets with vegetable peeler. Chop beets into 1/2 inch cubes. Add to roasting dish covered in aluminum with enough aluminum to fold back over roasting dish to form a pocket. Add 1-2 tbsp of olive oil and 1 tsp of salt to beets in roasting tray. Close aluminum pocket and toss beets to coat. Place tray with aluminum pocket in oven and roast for 1 hour and 30 minutes. To make balsamic glaze- Add 1/2 cup balsamic vinegar and 2 tsp of sugar to small sauce pan and bring to medium low heat. Cook with stirring until glaze has thickened to syrup consistency, about 5-10 minutes. 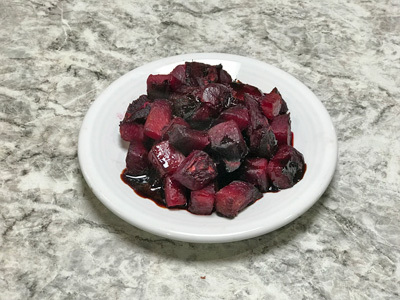 Remove beets from oven and coat with balsamic glaze. 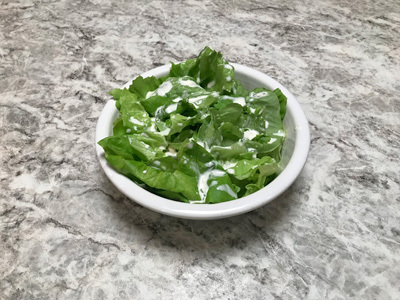 Ranch Dressing: in a bowl mix 1/2 cup Mayonnaise, 1/2 cup whole milk, 1/2 tsp onion powder, 1 tsp garlic powder, 1 tbsp of each herb, salt and pepper. 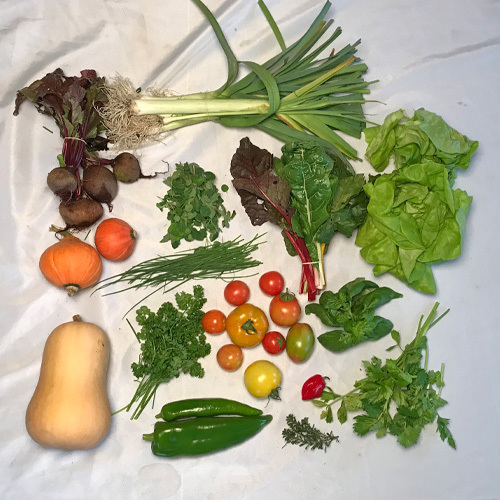 Mix well and serve over a bed of bibb lettuce.